The last of the SROs are closing and missions are moving out. The building at left in the picture below was the Prince Hotel. It's a few blocks south of the White House at 220 Bowery. It opened as the Prince Hotel in 1927. In the 1940s it was converted into an SRO to pack in soldiers being processed out of the military after being brought to New York City in troopships. 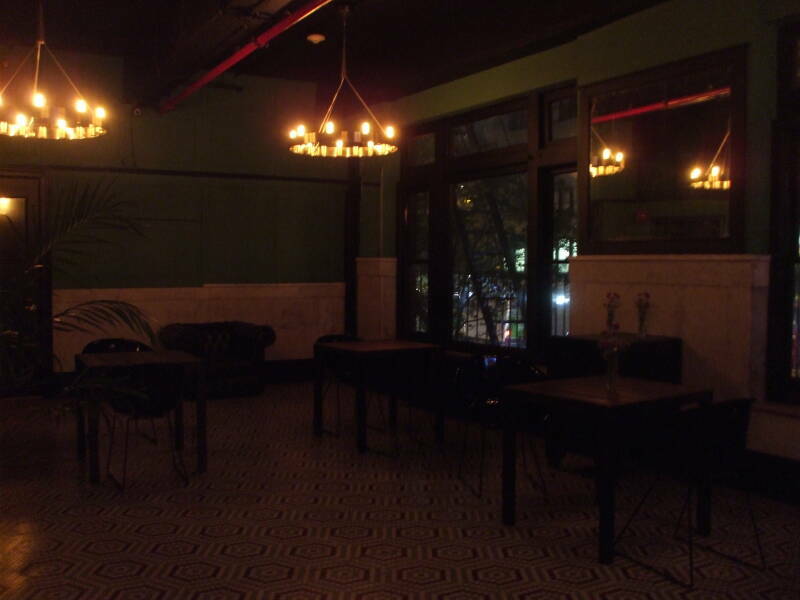 In 2011 it was renovated and reopened as the Bowery House, an SRO turned budget hotel. You can stay in one of their 1940s design cabins for about $60–90 per night. The building to its right is the former YMCA including "The Bunker", a windowless former locker room in which William S. Burroughs lived from 1974 until 1981. Mark Rothko, an abstract impressionist painter known for his fuzzy rectangles in various murky shades, maintained a studio in the former basketball gym for a while. The poet and Burroughs associate John Giorno also lived in the building, and was still listed on the doorbell panel in 2013. Across the Bowery from those two buildings is the Bowery Mission, which was founded further south into Chinatown in 1879. It was the third rescue mission established in the U.S. and the second in New York City. 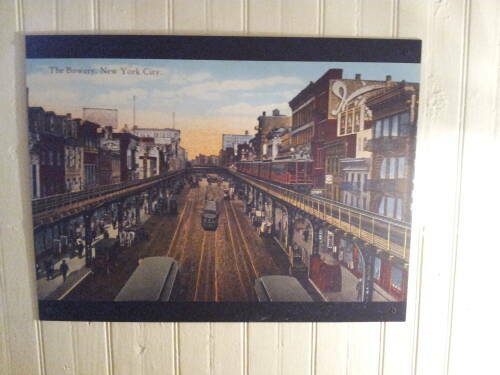 It moved to its current location at 227-229 Bowery in 1908-1909. These are the two brick buildings at the center of the first picture below, and toward the left in the second picture. 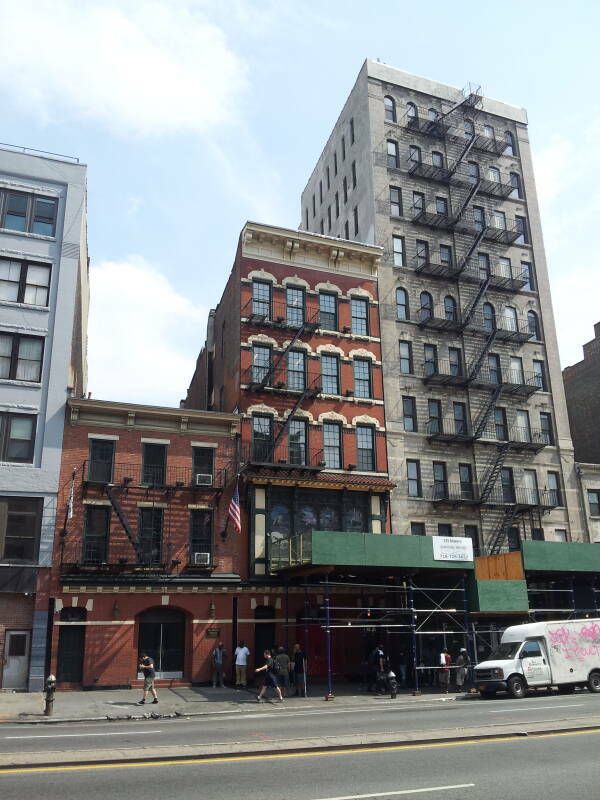 The five-story building at 227 Bowery had been built in 1876 for an undertaker and coffin manufacturer, it was modified when the Mission moved in. 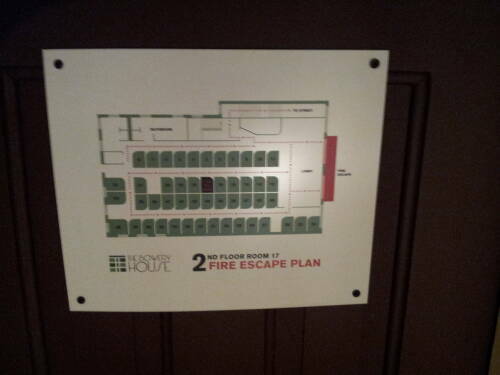 They were then able to expand into the adjacent three-story building at 229. 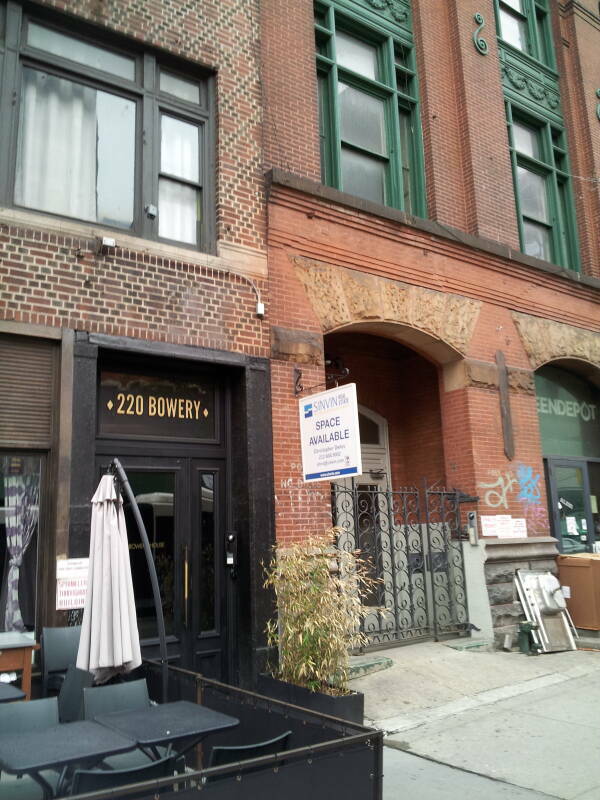 The Salvation Army had a location next to the Bowery Mission at 225 Bowery. 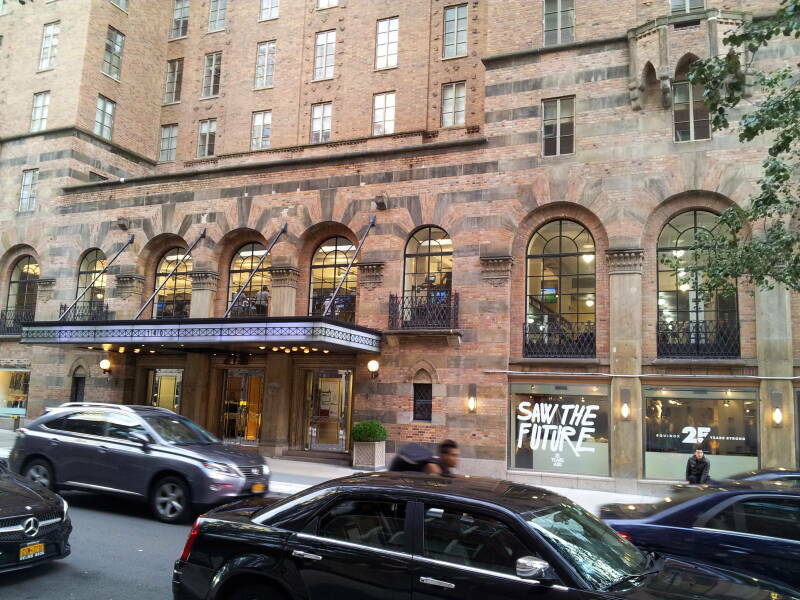 Ace Hotels bought that location for $30 million in March 2014 as the Salvation Army moved that branch to Brooklyn. I stayed at the Bowery House for the first time in May 2016, and have been back several times since. Let's go in. Reception is on the third floor, there are cabins on the second, third, and fourth. We have our key, let's find our cabin. 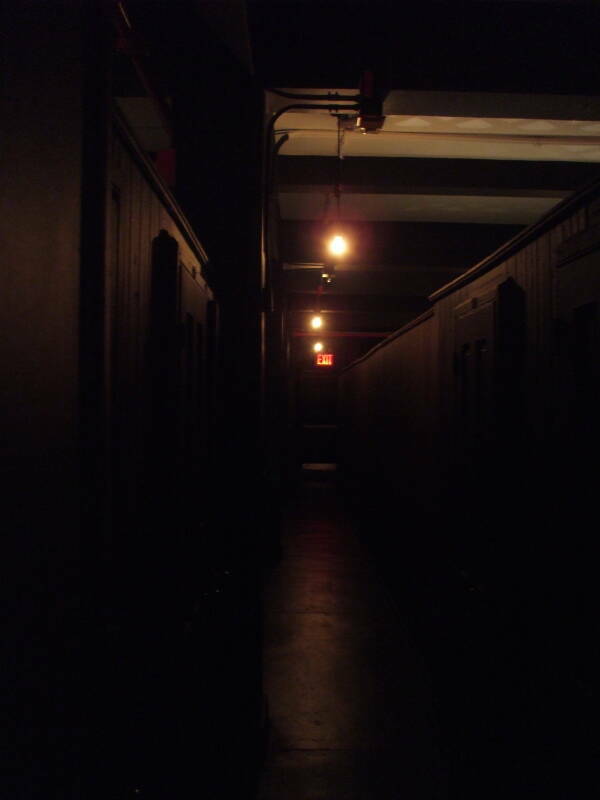 The hallways are dark even during the days. Here it is. The cabins are a little larger than those at the Whitehouse. 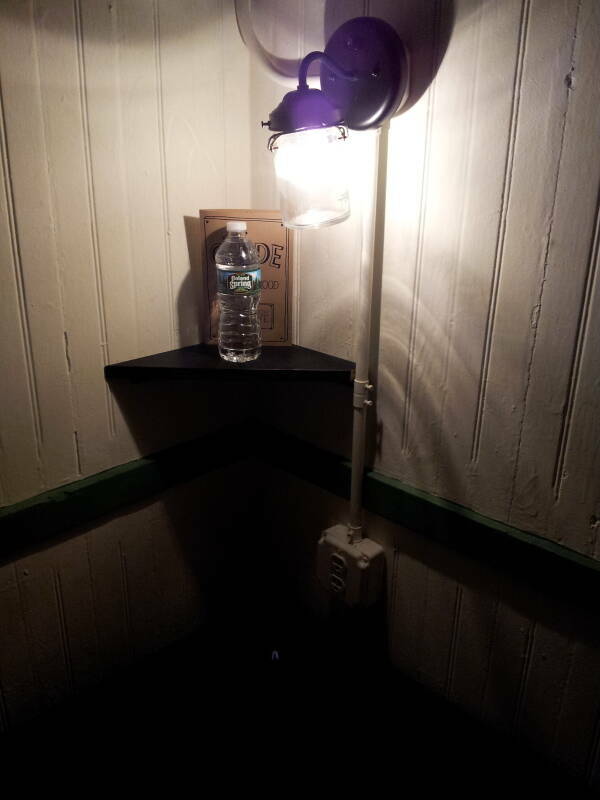 They also have electrical outlets. That's a nice upgrade from the White House, where you had to leave your electronics down at the front desk for charging. 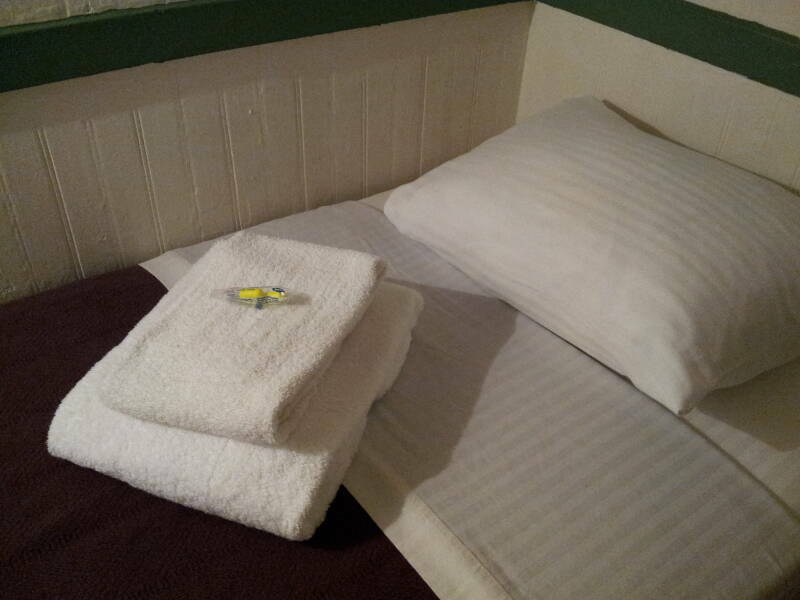 You are provided with a hand towel and a bath towel. You are also given a bottle of water and a pair of small foam earplugs. 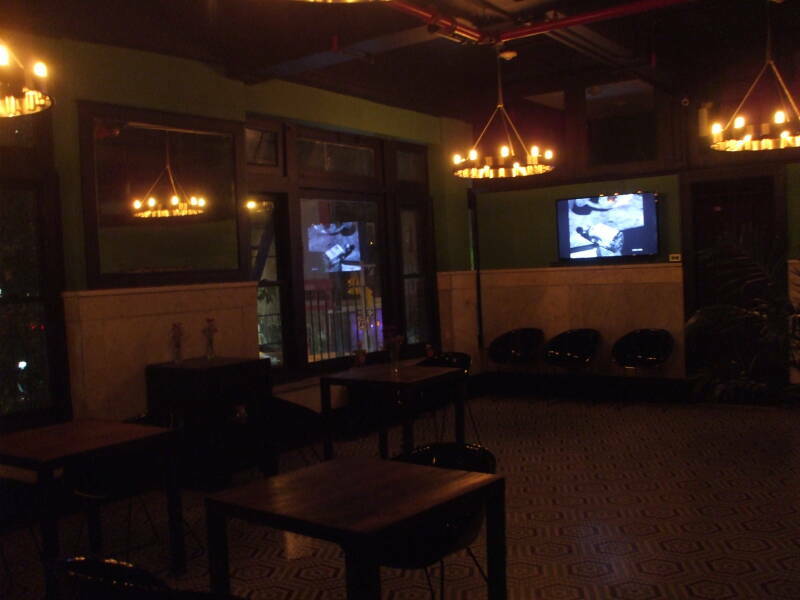 Each room has Bowery-specific artwork — old photographs or paintings of the Bowery, a photograph of The Ramones in front of CBGB, or a related movie poster like Bela Lugosi's Bowery at Midnight. 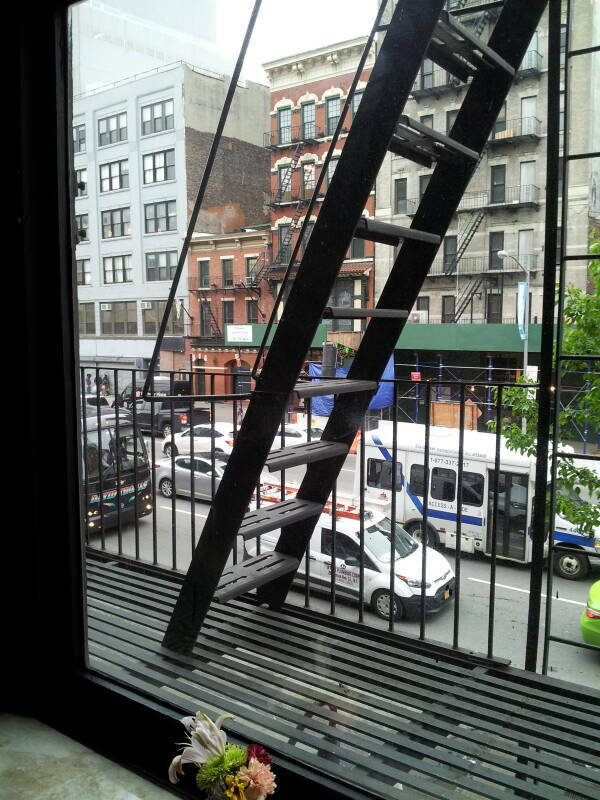 The roof top is open, with nice views up and down Bowery. 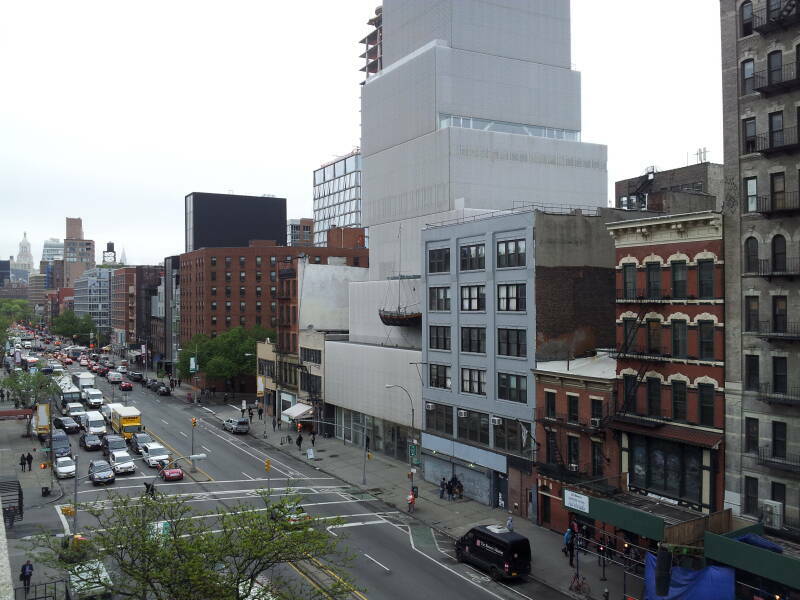 In the first picture below we're looking north, past the Bowery Mission and the New Museum. 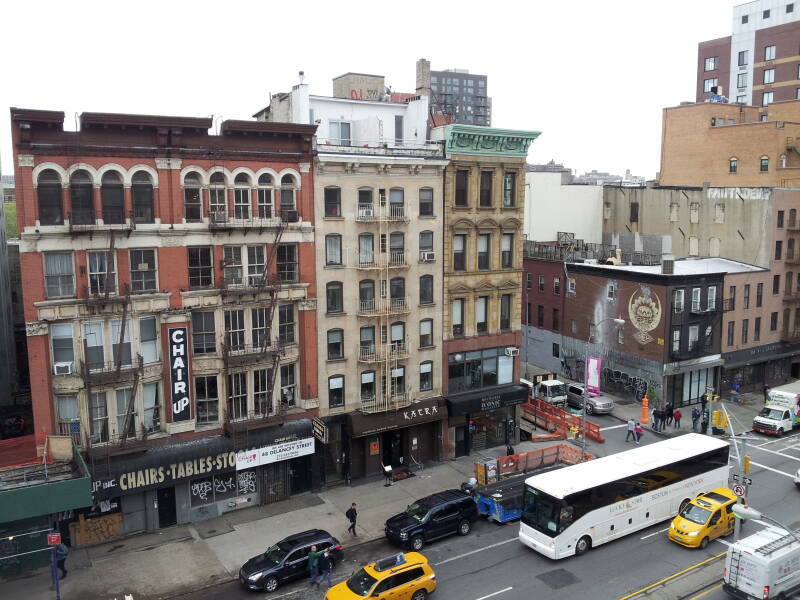 In the second picture above we're looking southeast across Bowery. There are lounge areas on the second and third floor, but since we're in New York and there is so much to do, not many people hang around here. In 2016 there were still three or four permanent residents who had been living there since the 1970s. You might meet one of them here. After a long day in New York, let's go up to the roof again. In the first picture below, looking north, you can see the Chrysler Building in the distance. It's the building with the white pointed top. 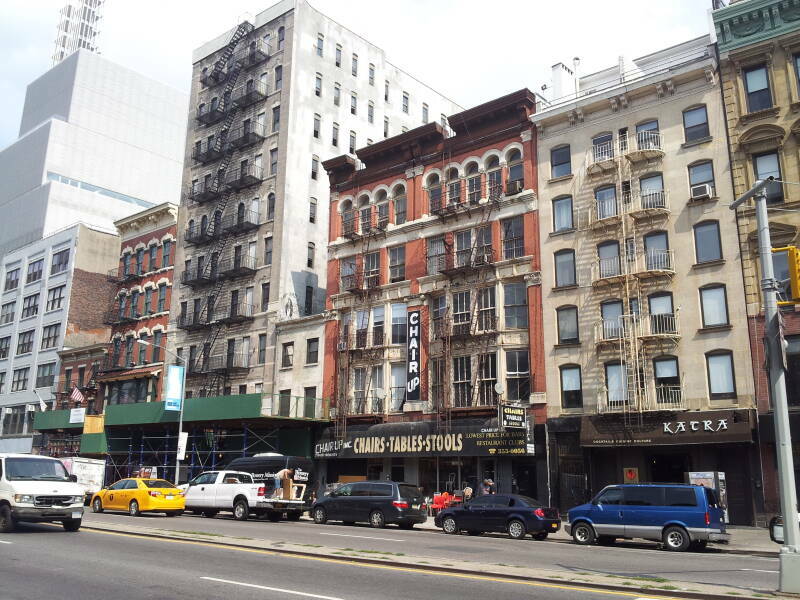 Further south on Bowery are the New World Hotel at 101 Bowery and the Bowery Grand Hotel at 143 Bowery. These are converted from SROs into budget hotels. 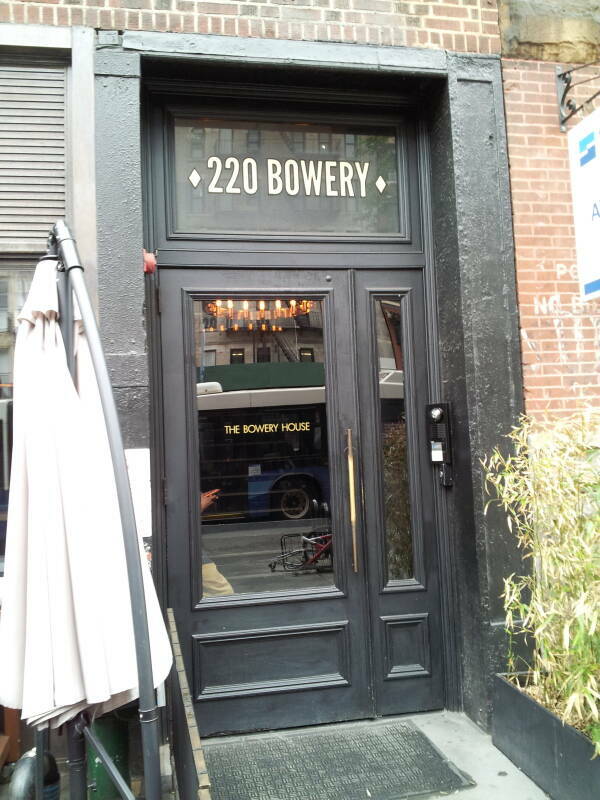 The Bowery House is proud of its background and makes it clear that isn't what most American tourists think of as a hotel. These places, which appear in on-line listings alongside national chains, may surprise the unwary American traveler who thinks they found a good deal on a typical tourist hotel. 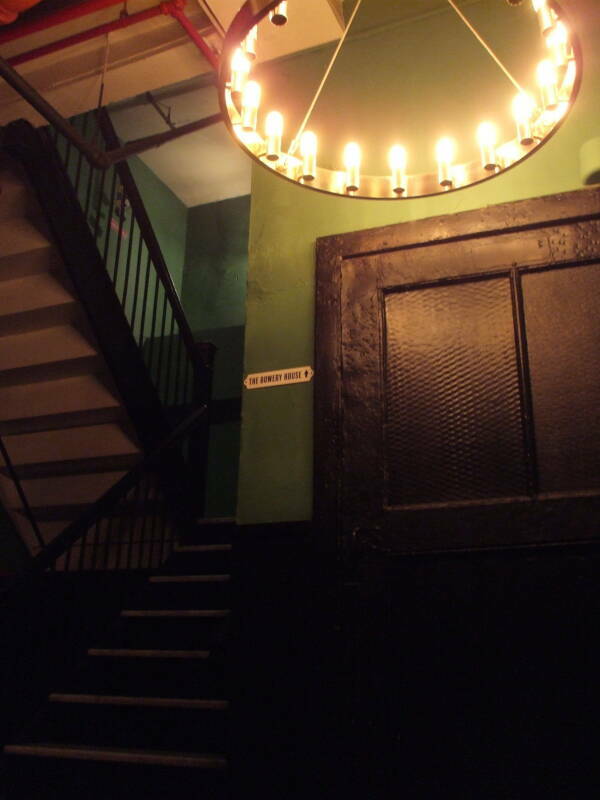 One of the staff at the Bowery House told me that they have had a few guests who started their stay in New York at one of these two, and found that a move to the Bowery House was a significant upgrade. The Bowery Lodge, a little further south at #81 Bowery, seems to have remained an SRO a little longer than the New World Hotel and the Bowery Grand Hotel. But by late 2016 it was also converted into a low-cost hotel. 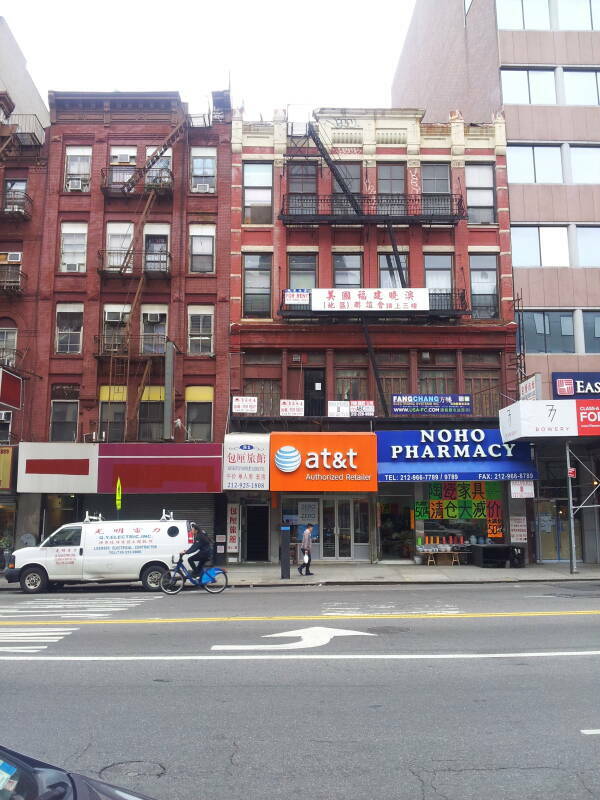 The entrance is under the white awning, the hotel is upstairs above an AT&T store and the Noho Pharmacy. 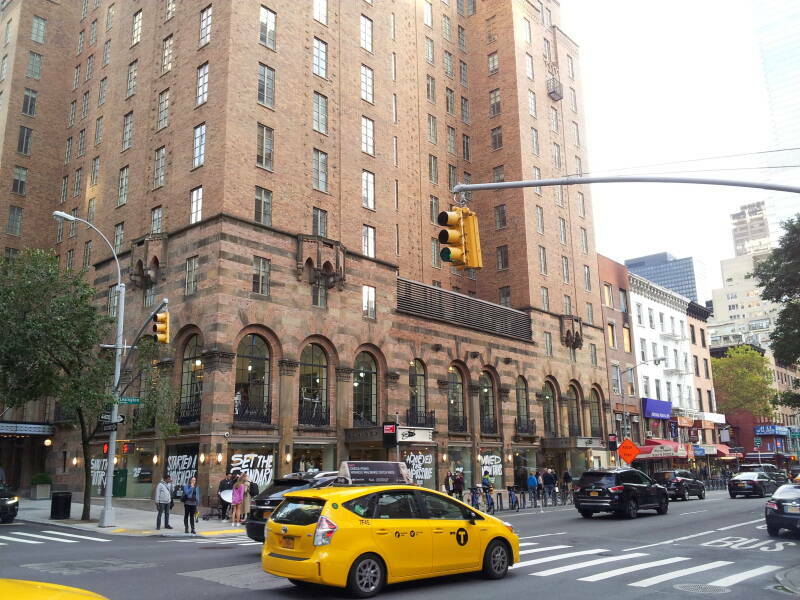 There are some prominent former residential hotels for women in Manhattan. One is now converted to condominiums, another is a hostel where you could stay for a few nights. A third has been repurposed into transitional housing to get people off the streets and into permanent homes. 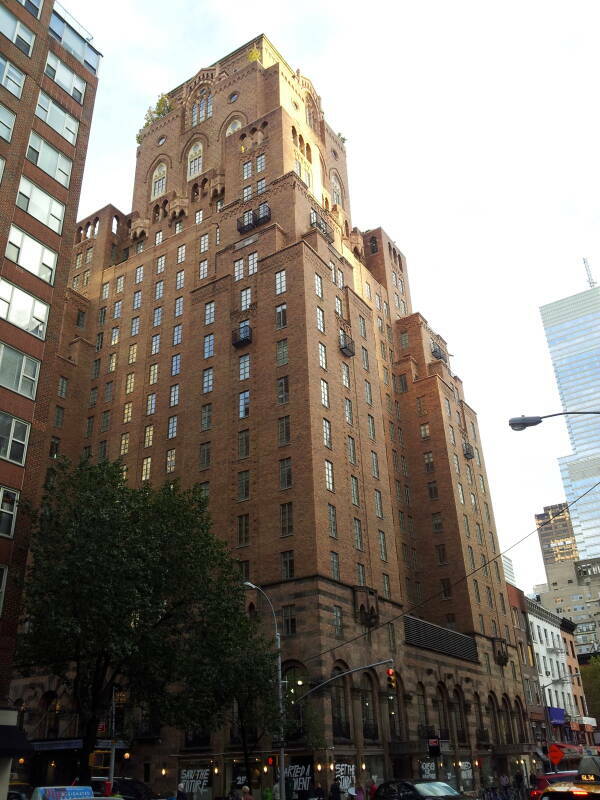 The Barbizon Hotel for Women was built in 1927 at 140 East 63rd Street, where it crosses Lexington Avenue. It's a 23-story structure with a steel frame supporting concrete walls, covered in brick with limestone and terra cotta decoration. It was a residential hotel for women intended to provide a "safe refuge" for its occupants. 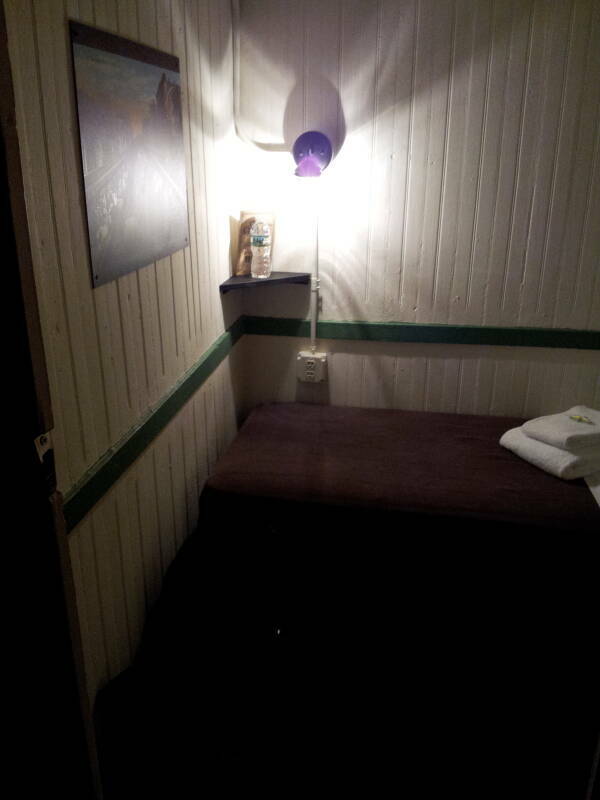 It had very small private rooms with shared facilities, at least conceptually like the men's SROs. 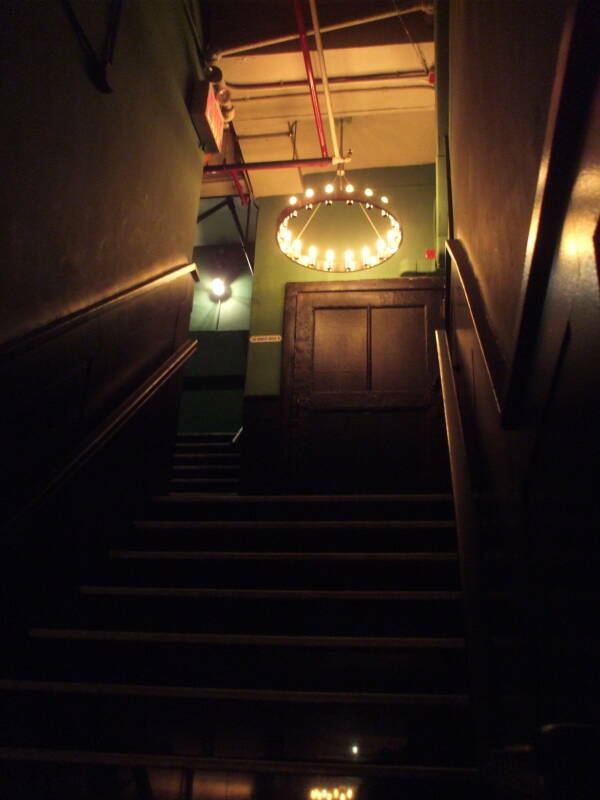 Dress and conduct codes were strictly enforced, and men were not allowed above the first floor. It had a swimming pool, Turkish baths, a sun deck, squash and badmiton courts, a solarium and roof garden, a beauty parlor, and a coffee shop. Residents included Lauren Bacall, Joan Crawford, Grace Kelly, Candice Bergen, Ali MacGraw, Cybill Shepherd, and Jaclyn Smith. Sylvia Plath lived there, and the building featured prominently in The Bell Jar. Barbizon Hotel, southeast corner of Lexington and 63rd. 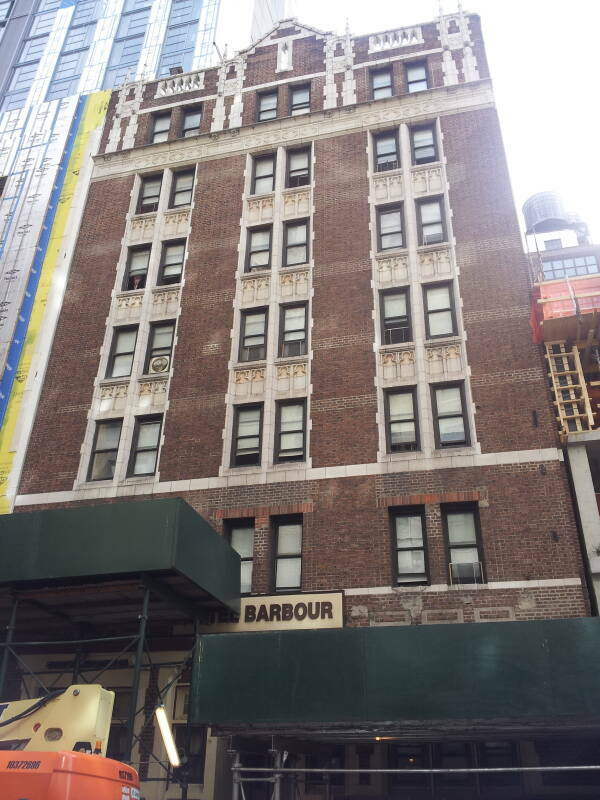 Barbizon Hotel, Lexington Avenue side. 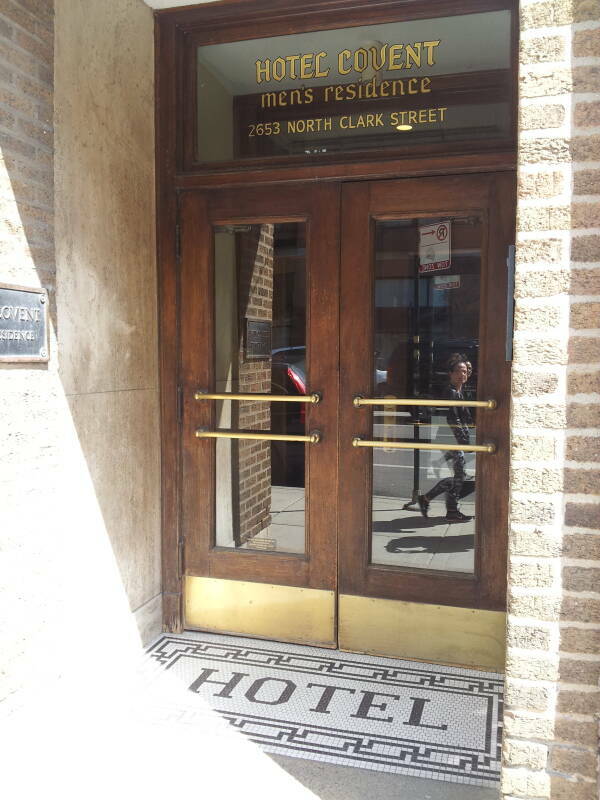 Barbizon Hotel, 63rd Street entrance. The Association for the Relief of Respectable Aged Indigent Females was founded in 1813. For its first 25 years it collected and distributed funds to women they felt were worthy of receiving the support. In the 1830s they decided that they needed "an asylum to house some of the pensioners". 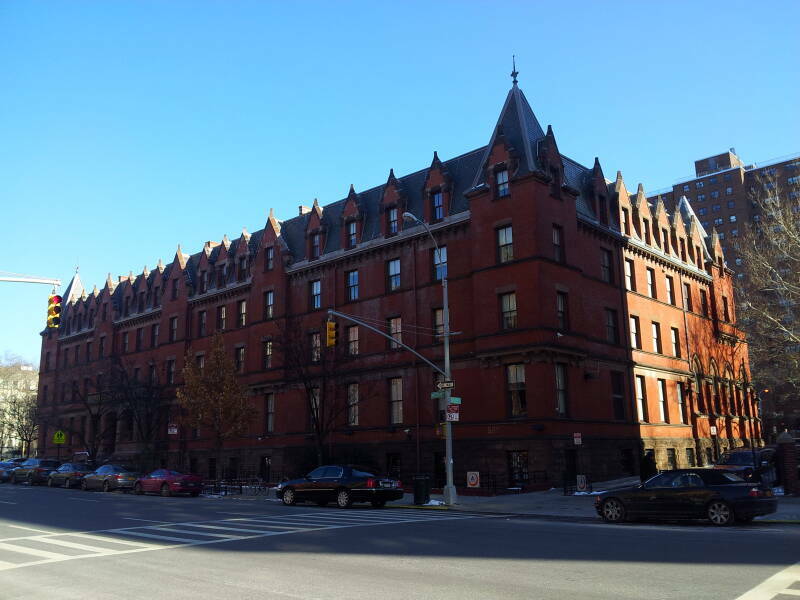 Their first asylum opened in 1838 on East 20th Street between First Avenue and Second Avenue. 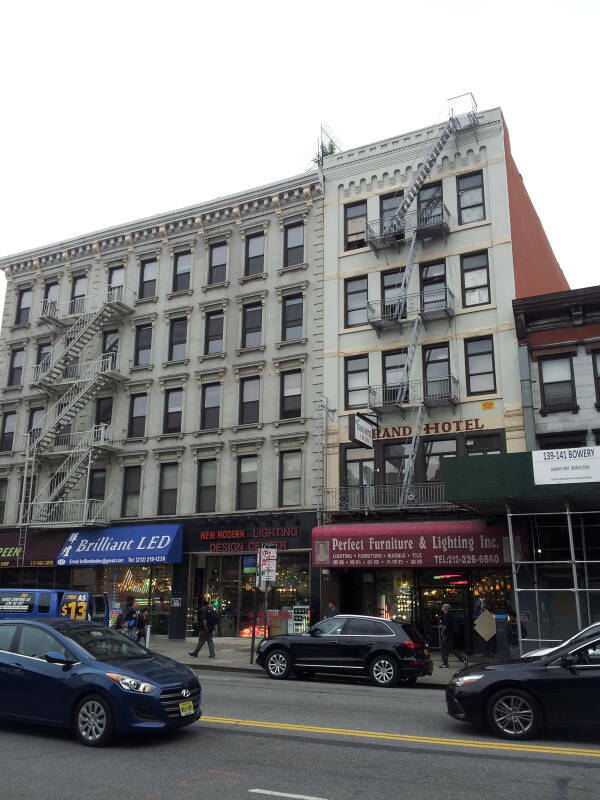 In the 1880s they bought property between 103rd Street and 104th Street on Tenth Avenue (now called Amsterdam Avenue), and opened a new building in December 1883. It had enough space for almost every resident to have her own room with a fireplace, plus a dining room and kitchen large enough for 100 residents. 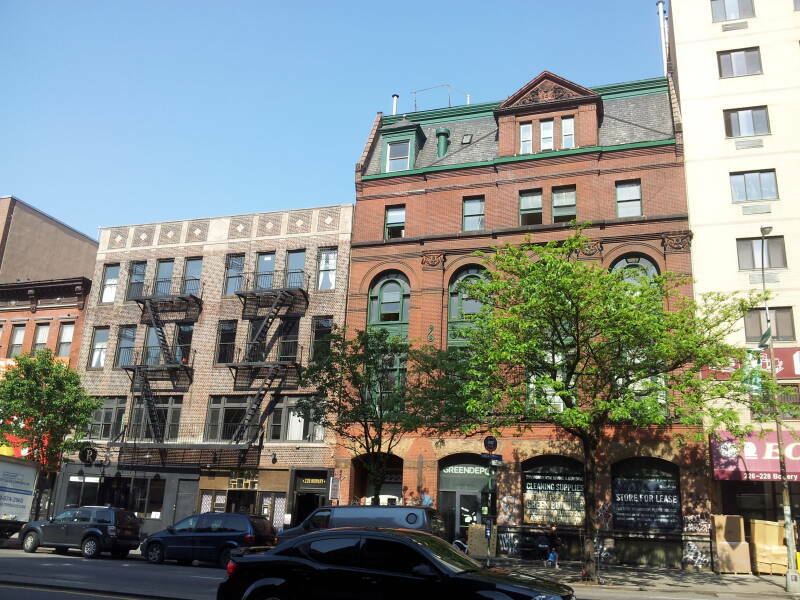 The neighborhood also included a Home for the Destitute Blind in the next block north, across 104th Street, and the Bloomingdale Insane Asylum which was later absorbed into Columbia University's campus. The Association Residence for the Relief of Respectable Aged Indigent Females kept operating, with extensive renovations in the 1960s that added a new elevator plus shared bathrooms for every two rooms. But by the end of the 1960s the federal government funding through Medicare and Medicaid required meeting further operating and safety inspections which the Residence could not pass. The Association wanted to tear town the building and replace it. 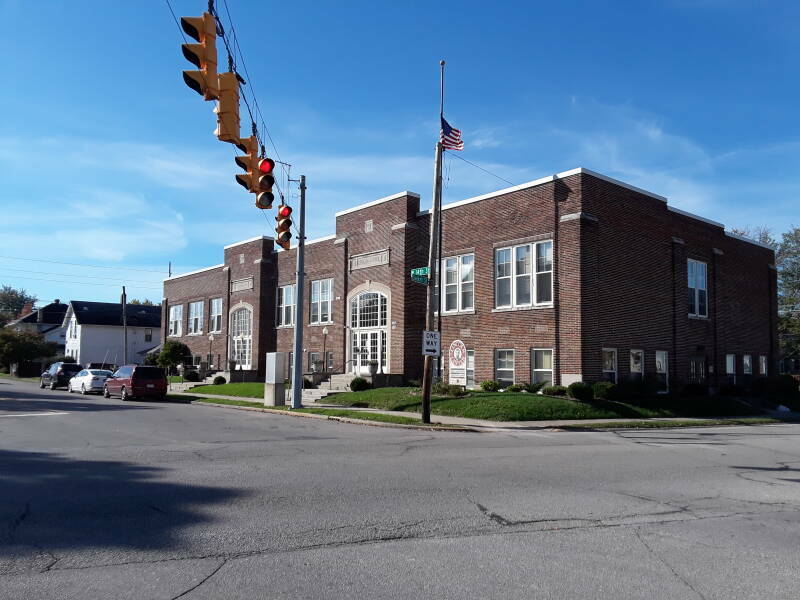 However, it was placed on the National Register of Historic Places. In order to use federal funds to tear down a listed building, the only way they could afford to do so, they had to create an environmental impact statement. The remaining women were moved out in 1974. Scavengers began stripping out the copper pipes and wiring, and the city wanted to tear it down as it was a "fire, health, and moral hazard". The windows and doors on the bottom two floors were sealed in metal sheeting. 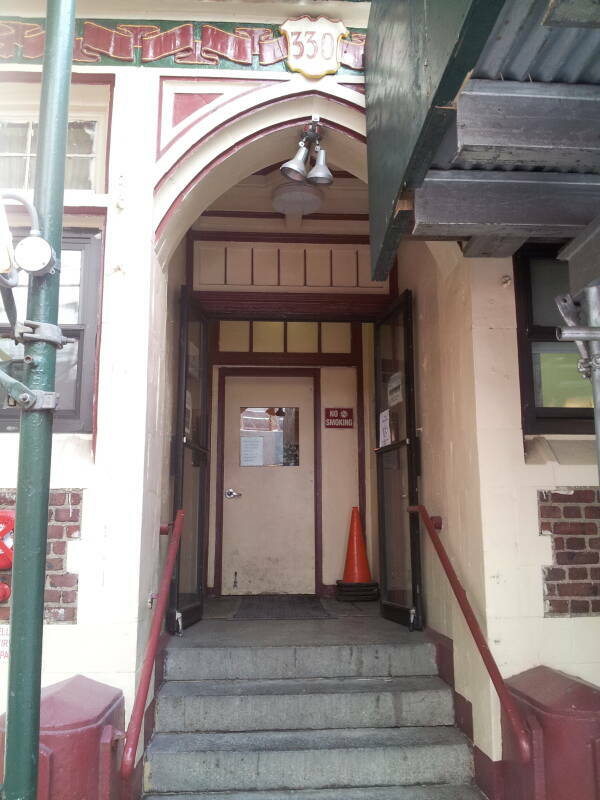 The American Youth Hostels organization began looking for a site in New York in the late 1970s, and found the building. Reconstruction began in 1987. It opened as a hostel in January 1990, with 480 beds. Now it has 670 beds, the largest in North America. 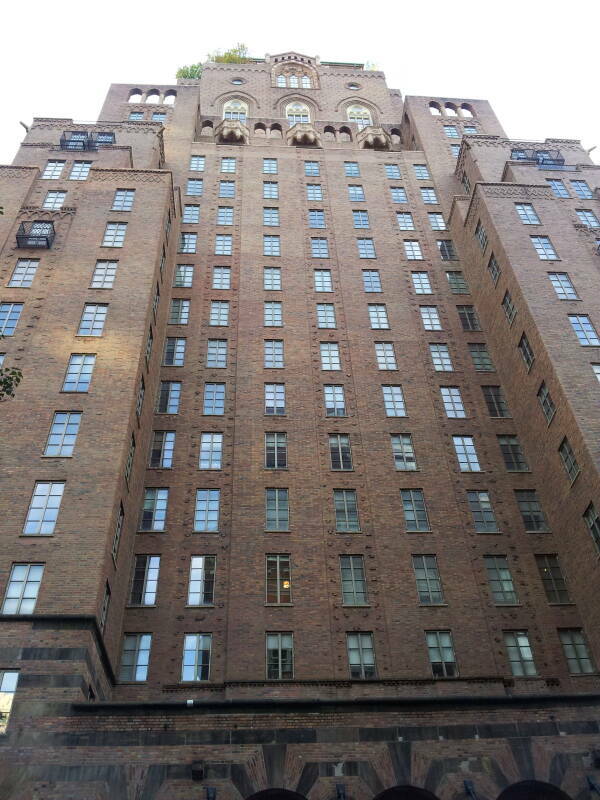 The Hotel Barbour is in Midtown Manhattan. 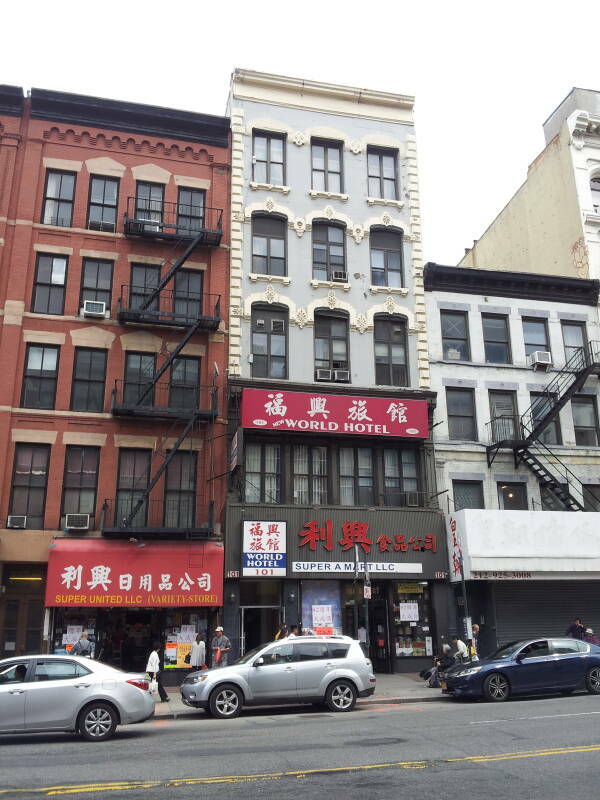 It's at 330 West 36th Street near Ninth Avenue. It operated as an SRO until at least around 2010. By 2017 it was operating as transitional housing. It was where homeless people could stay while transitioning to permanent housing. James Harris Jackson was a white Baltimore man whose hated black men. Made bolder by the increased tolerance of white supremacy under the Trump administration, he traveled to New York to hunt and kill black men around Times Square. The man he happened to select and kill with a miniature sword, Timothy Caughman, was a benevolent man on the staff at Hotel Barbour. It was described as his longtime home, so I assume that he had lived there for several years when it was an SRO. Timothy was the son of a pastor and a home health care aide, and he had worked in antipoverty programs in Queens. At the Barbour he worked with the recently homeless families and individuals. 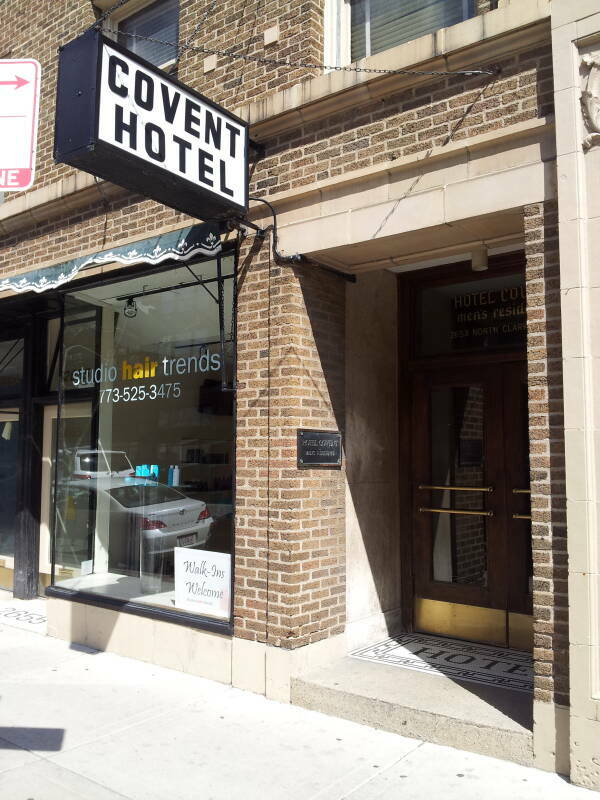 The Covent Hotel is at 2653 North Clark Street in the Lincoln Park area of Chicago. As of April 2016, it was still in operation with some occupants, as you can see in the second and third pictures below. 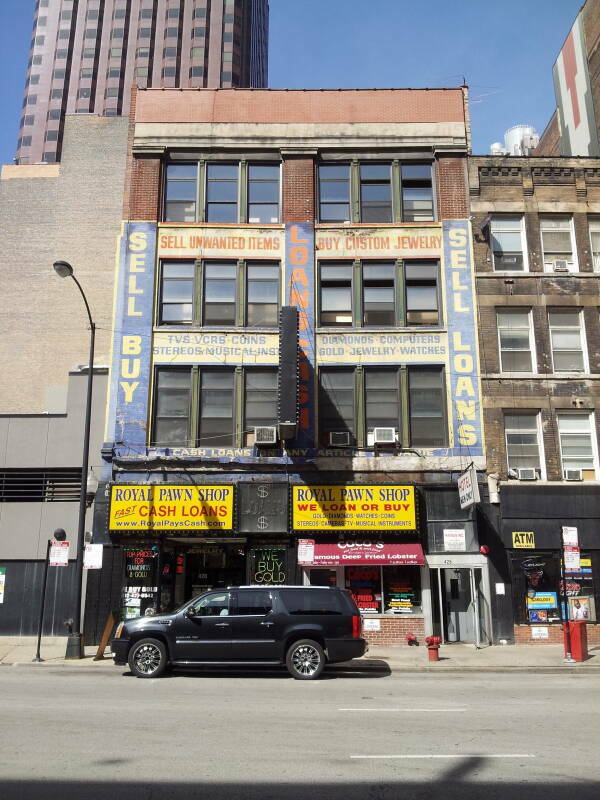 There's another Chicago SRO on 422-26 South Clark Street, in the first block south of the El in the Loop. 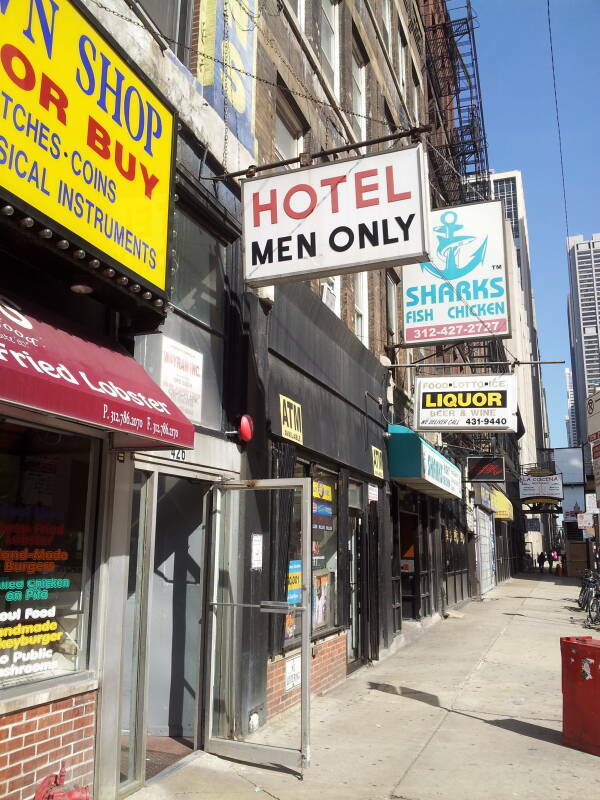 The only sign says just "HOTEL" and "MEN ONLY". 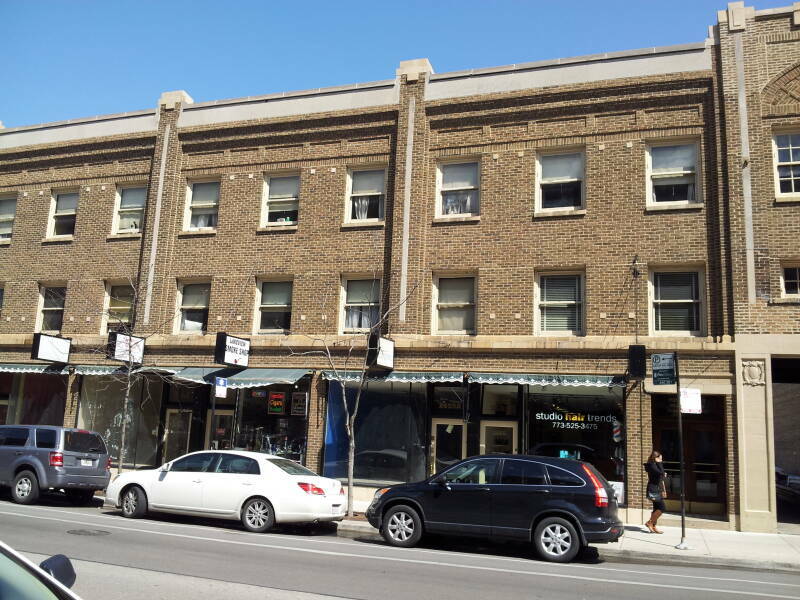 According to this Streetwise article it was the Ewing Annex in 2013. A cubicle was $15/day, $90/week, and $300/month. "Many tenants are disabled, having been placed there by organizations such as Thresholds, Sisters Outreach and Salvation Army. Others are retired. Students of traditional age from 11 area colleges also reside here. Of the 210 rooms, all but nine are in use. Some tenants have lived at the Annex for over 30 years. The average stay is eight years. 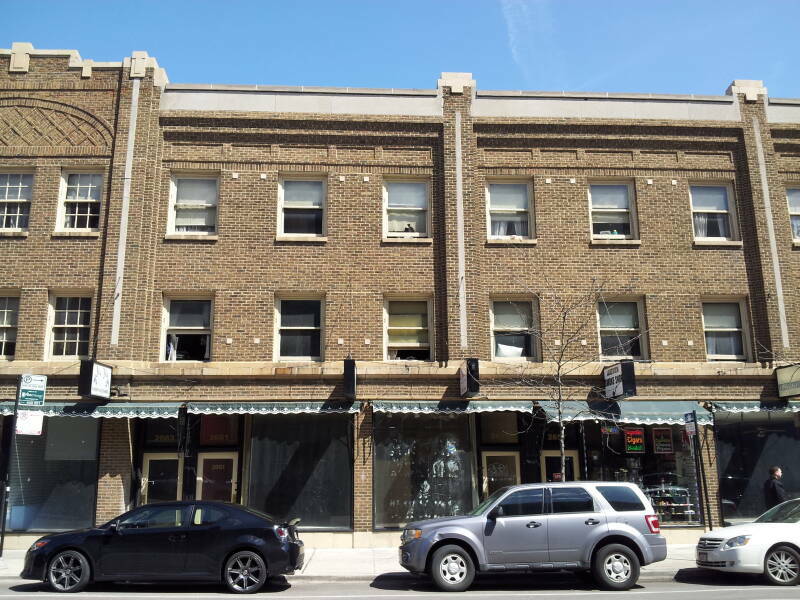 The Annex was formerly known as the Working Man's Exchange — the home to not only weekly tenants, but the location of city council meetings, film shoots (Batman), and more recently, a site for historical tours." 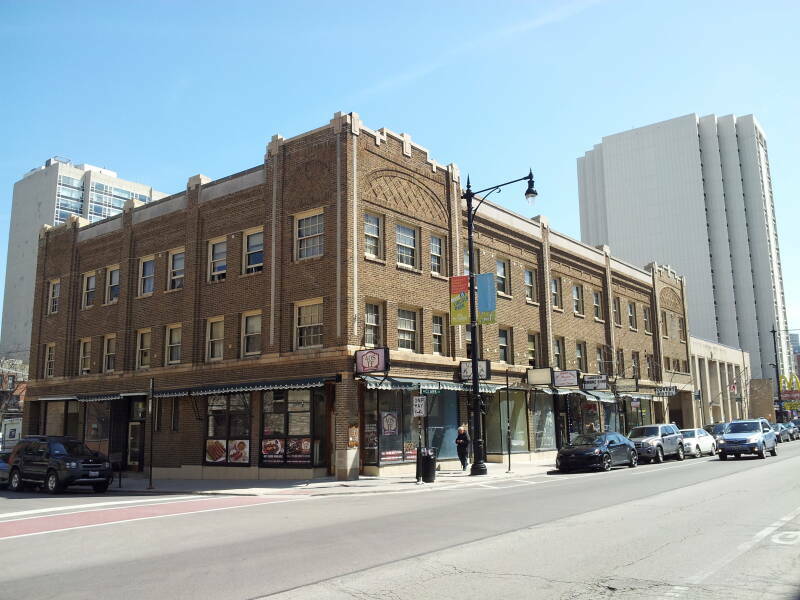 That article went on to say: "The Ewing Annex Hotel and the Wilson Men's Hotel, 1124 W. Wilson Ave., are the only remaining cubicle hotels in Chicago. In the 1920s and '30s these hotels, and many others, served as temporary housing to workers of the Stockyards, factories and steel mills. Each cubicle in the Wilson is 6-by-9 or 6-by-10 feet with chicken-wire ceilings separating one from another. 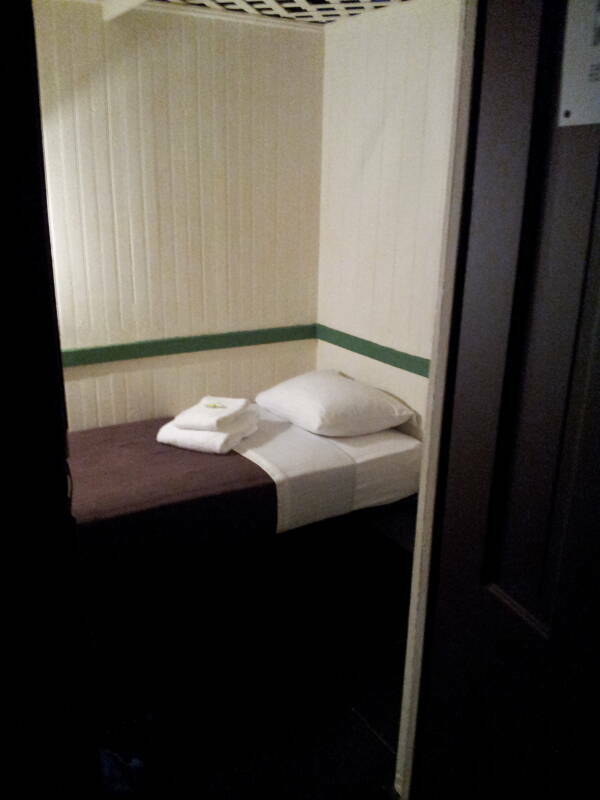 The Ewing Annex Hotel rooms are a little smaller. Some cubicle rooms are slightly raised above the ground, forming a gap between the walls and the floor. The restrooms are communal and shared by all men on a floor—sometimes as many as 60." 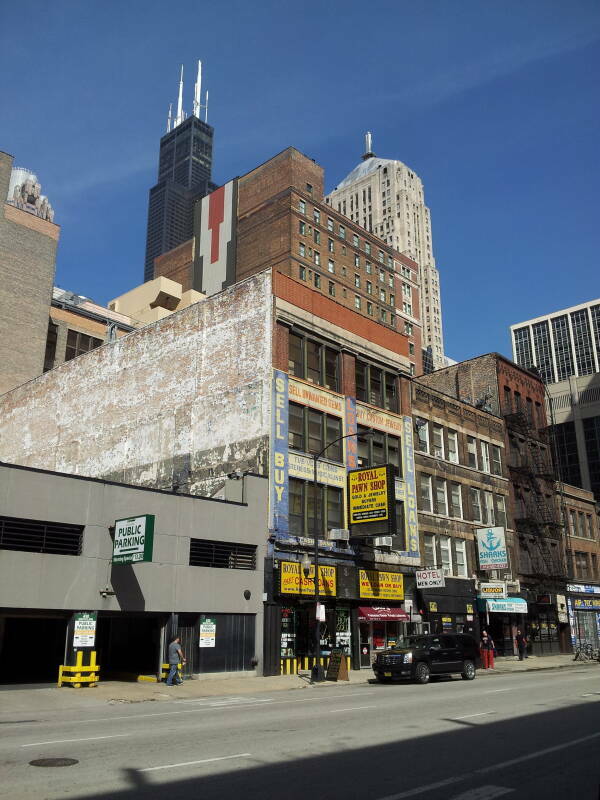 It was also described in the Columbia Chronicle and on chicagohomeless.org, which also mentioned the Wilson Men's Club Hotel at 1124 West Wilson. Elwood Blues lived in the Plymouth Hotel. 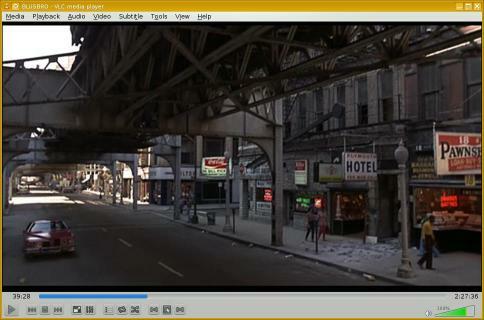 I don't think the address is mentioned in the movie, but a display at Union Station on Chicago movie locations said that it was at 22 West Van Buren. By the 2010s this was a small park on the northwest corner of Van Buren and State, along the south side of the El line around the Loop. The Harold Washington Library was then on the opposite side of Van Buren. 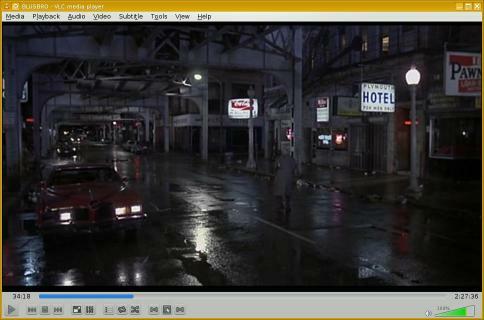 Here you see it at 34:18 and 39:29 into the movie. The "Mickey Finn", a drink with chloral hydrate or other knockout drugs, is probably named after the manager and bartender of the Lone Star Saloon and Palm Garden Restaurant. That business operated from 1896 to 1903 on the west side of State Street just north of Congress Parkway. 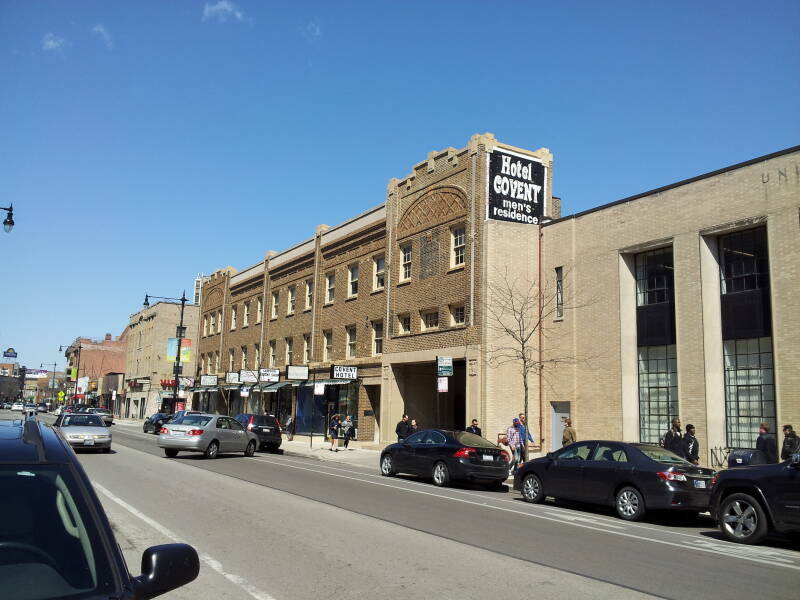 That location is now occupied by the Harold Washington Library. The Lincoln Center on North 14th Street in Lafayette, Indiana, offers SRO housing. It's in a former elementary school building. The Lincoln Center is operated by the Lafayette Transitional Housing Center.